Saturday, October 7th, 2017 @ 10:00am. 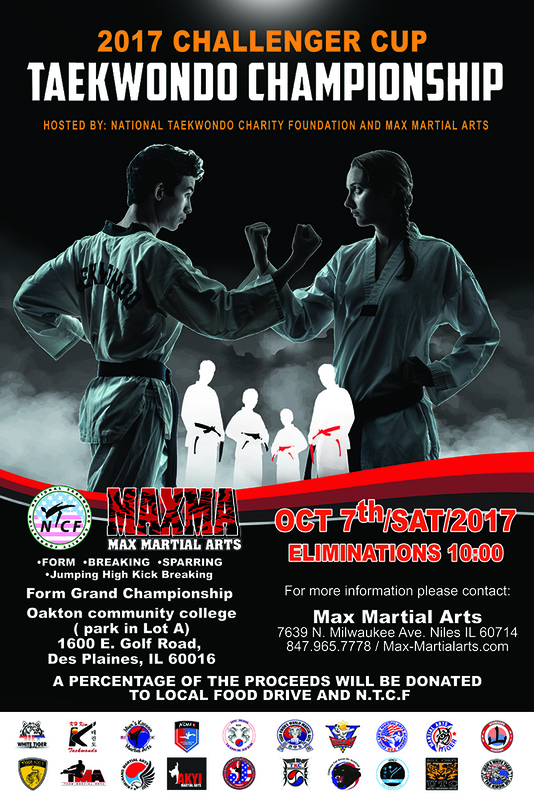 This fall The National Taekwondo Charity Foundation and Max Martial Arts are hosting an open Taekwondo championship tournament. Participants will be judged by panels of professional martial artists in sparring, board breaking, and Poomsae. The tournament will also feature a jumping high kick breaking competition. Despite competition and judging, the open tournament is designed to be a learning experience for both novice and expert students. All Taekwondo schools in the Chicagoland area will be eligible to participate. In addition to students, family, friends, and taekwondo enthusiasts are encouraged to attend.